Guy Who Used Billboard To Court Erich is A Scammer, According To His Alleged Victim! Have you heard the name, Xian Gaza? If in case you missed it, he is the guy who used the advertising billboard to expressed his desire to have a coffee date with Erich Gonzales. Sounds cool right? But few days after his courting antics goes viral in social media, A Twitter account user named Dewanie Catapang tweets and rant against this guy and accused him of being a scammer. Why is that he looks so familiar? Maybe because you already saw him more than once in your life. For the benefit of those who don’t know. Xian Gaza is the CEO of Gazera Media, who is also an accountable admin of the famous Facebook page “FILIPINO VINES “. 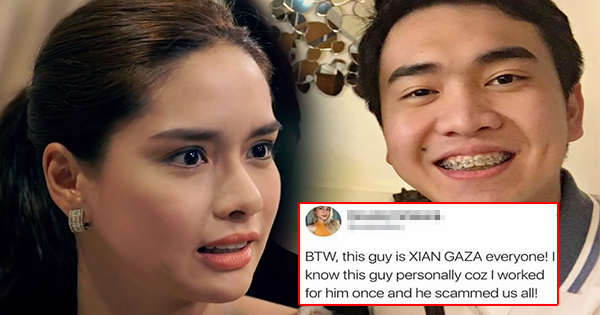 Now, as his name trends in online communities for being rich and a young successful millionaire, Xian Gaza was accused of being a scammer by his alleged victim a few years ago. Twitter user @waniedoo tweeted that she personally knew Xian Gaza because she worked for him before and was scammed by Mr. Gaza. She said in this photo that she really want to reveal the real identity of Xian Gaza and his antics in social media. Dewanie also said that Xian Gaza uses social media to trap the girl he wants so that the girl will be forced not to say no. Ms. Catapang also said that she knows the consequences of her tweet, but want to serve as an eye opener for everyone not to believe everything they saw in social media. I Am Henz replied to one of Dewanie’s tweet saying that his friend was also scammed 500,000 pesos by the same person. Dewanie also revealed that the Bobbi Brown which Xian posted for Erich was the same Bobbi Brown photo which was uploaded on 2015. Dewanie also revealed that Xian Gaza tried to flirt with her. “Marami pa syang nascam dito sa davao , hindi lang ako ” Dewanie revealed in her tweet. Ms. Catapang said that she wants to end Xian’s Antic that's why she posted this.